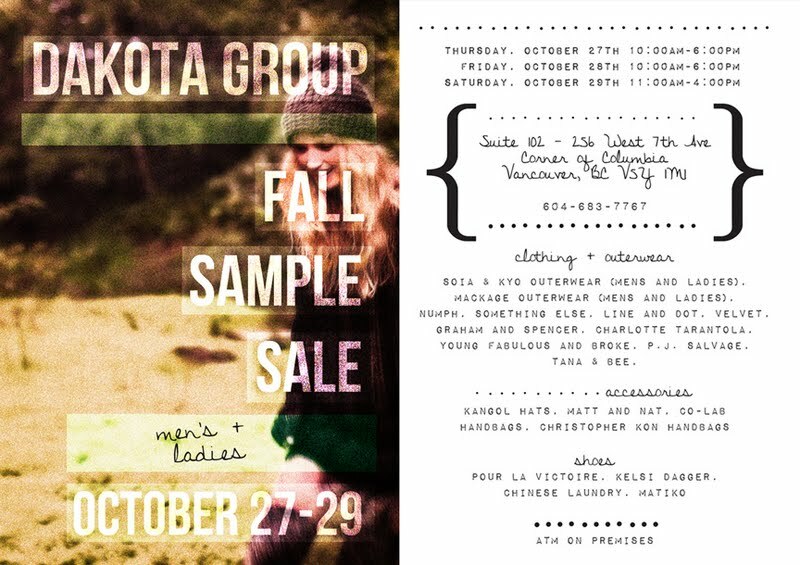 The legendary Dakota Group sample sale returns for another season starting today. At the pre-sale, I spotted lots of boots and shoes from the likes of Pour La Victoire, Kelsi Dagger, Matiko and Faryl Robin. (I also found the Pour La Victoire 'Marne' boots in cognac leather with brass hardware that I've been eyeing since forever at 50% off retail. Score!) If it's outerwear you're looking for, there were plenty of great coats from Mackage and Soia & Kyo too. Click the flyer above for full details. Happy shopping! 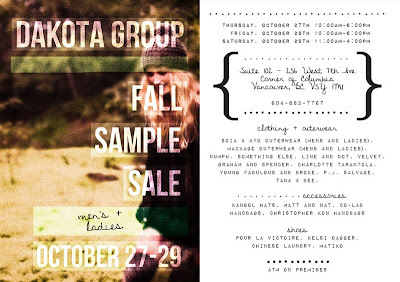 Ah, I had forgotten about this sample sale, definitely will have to make time for it! I saw your new boots on Pinterest - absolutely gorgeous! Did you end up getting anything else? Still sad that I'm not a size 6... oddly my feet have grown since the last sale too so there is now no way I can jam them into a pair of these beautiful shoes! Jen, I only got the boots because I was trying to be good. My manager (who was my plus one at the pre-sale) bought a Soia & Kyo coat though. This sale is legendary! I've been the lucky recipient of Kelsi Dagger boots, Matiko shoes and a Mackage jacket in the past!